PA/TNA Dd will be starting college in the fall. Trying hard to work with her college of choice to make a safe environment for her and it has been so stressful. While they are WAY more allergy aware than some I have dealt with, there is still a lot of risk. None of their dining areas are nut free and therefore no guarantee there. How will she eat? How do we keep her safe? If she lives in the dorms, she would need a single (which she DOESNT want, she wants to be with others) and they are only allowed a small fridge and microwave. No hot plates or anything else. Hardly an ideal way to make sure she always has her own food. Not a lot of advice for you-- honestly, DD's allergies are such that (knowing what we know about college campuses, dorm environs, etc) there is just no way that we'll do it. She might eventually transition to off-campus housing, but she has to be able to keep her own food safe, and she has to be able to prepare food for herself. Anyway. Identifying yourself to disability services on campus is the first step-- I take it that you've done that, yes? If you press, can you get permission for other appliances (maybe an induction hot-plate?) for her? Honestly, she's going to HAVE to be flexible enough to realize that her college experience may not be identical to that of her unaffected peers. That's simply the way that it is. She's not alone in not getting "the" college experience that she imagined, by any means-- but taking risks with your management strategy in order to live more normally.... hmm.... there's a limit to what is wise there, yeah? There's a lot more to being ready to fly than wanting to live away from home for our kids. Unfortunately. Being truly ready also means being mature enough to accept that you have to compromise on what you want so that it's feasible in light of the very real limitations on your food safety, KWIM? That means not eating in a high-risk setting 2 or 3 meals a day for four years, at least if you're someone with a low reaction threshold. I'm happy that my DD hasn't really fought this all that much-- she packs food rather than planning to purchase lunch (generally has a back-up plan even if she does plan to purchase something that she's scoped ahead of time), and seems to accept that this is just her lot in life. It sounds like your DD isn't accepting that she may HAVE to live in a single-- maybe that is just the impression that I'm getting. I get some of this is lack of experience, too; my DD doesn't understand how food-oriented a lot of sorority affairs are, and has it in her mind that she'd like to go through Rush. I'm not telling her "no" but I'm also not really encouraging it, either. I feel for you. It is very stressful. The hot plate may be non-negotiable. Yes, I think it's silly too but even professors are not supposed to have anything but a microwave or small refrigerator in their office. I've tried getting DH to stock something else in his office for years and he can't/won't. It probably is rooted in fire hazard as it's not limited to students. Right-- and that's where I'm thinking "induction" might be an exception, since it's not a thermal source any more than a microwave is. Does she have a 504 designation? In our case, no even to the magnetic stand-alone. IMMV. It had to do with the described activity of cooking being prohibited, I think. Much like they aren't supposed to have cots in office to sleep or use it as some sort of occupancy but that's for offices to prevent faculty from squatting. Silly me-- I thought it was to prevent faculty from SLEEPING. At all. Mac's point is a really good one-- if she has a 504, take a copy of it with you to disability services. She should qualify for one in higher-ed, too. At DS's college they are not allowed to have anything with open heat source like toaster, hot plate, etc. but they are allowed to have closed heat sources like George Foreman grills, crock pots, electric kettles, etc. I wonder if they'd be able to work a compromise with you on that? You'd be surprised what all you can cook on the George Foreman! That being said, IMO, if your DD can successfully eat in restaurants she may be able to eat in the dining hall. I have a very low threshold for peanut (both contact and airborne reactive) and was able to do it. Granted, I didn't eat a lot of variety, but I was able to find food. The schools I attended where I dined in the dining hall had various stations like grill, pasta, pizza, hot entree, wok, etc. The grill, pizza and pasta stations were always safe. Plus the baked potato bar. I wiped my table when I sat down, kept my food on the tray and avoided anyone eating nuts/peanuts. Breakfast was the worst with pb on toast/waffles/bagels, but I'm not really a breakfast eater, so I just didn't go. If I was hungry I grabbed a snack in my room. DS, with a slightly better threshold than mine, has been able to eat in the dining hall, also. His university posts all the menus online and you can filter them by allergen. He uses that to see what to avoid and even if he should avoid a particular dining hall (like the vegetarian one). FWIW, DS and I both live(d) in doubles. We haven't had a problem with our roommates being unwilling to keep nuts/peanuts out of the room. Obviously, if our egg or milk allergies were very low threshold the dining hall would have not been an option. Sorry it took me so long to respond. It's been a stressful, busy few weeks!! To follow up with some of your ?'s. No, she does not have a 504 but Yes, we have spoken with special services and they said she does qualify for an ADA medical room. The cost is higher but it will provide her with a larger single and her own sink etc to help reduce risk and cross contamination issues that will come with a roomate. DD is worried. She is very social. She is worried she is going to feel isolated and get depressed and I understand that concern also. CMDeux- I agree that sometimes (esp for our FA kids) being mature enough to realize what they need to keep them safe vs what they think is "normal" is absolutely essential. It was heartbreaking to watch the moment she really realized how tough this was going to be for her vs her peers. I think staying home and going to the local college would have been much safer and easier for her (and me! ) but she also really wants some independence and is really looking forward to the college experience. I am hoping we can find a safe balance where she is able to go but with proper precautions. She is very responsible and has worked hard but has always had our safe home environment where I do all the grocery shopping/meal planning. She CAN do these things but is unbelievably busy in high school. My point is, she does have a decent head on her shoulders and always carries her Epi. Ideas on how she is going to be able to safely eat and get through her freshman year without the meal plan or a full kitchen?? She will have a larger fridge, access to a grocery store, and they will allow her to have a George Foreman in her room. Aside from all the scary thoughts running through my head, I also worry about her surviving on Enjoy life bars for a full year!! That can't be healthy! :) There is also a Chipotle, Dominos and Wendys nearby so that will help also. My son is a Freshman in college and is PA only. My son has done well in the dinning hall like Rebekanc's son. He is also in a double room. His roommate has no problem with not bringing any food that was not safe into the room. His roommate had classmates all through school with food allergies. Most teens know someone with allergies. If your daughter is not on a food plan she can still go in and socialize with others while they are eating. Our kids (mine anyway) has had many social events where food is served and he just doesn't eat. Most dorms have a communal kitchen. She can keep safe cooking pans/etc in her room. Students get pretty tired of eating dorm food and I'm sure would love to share a meal she cooks in the dorm kitchen. If a communal kitchen is not safe ask if she can bring a hot plate/toaster oven into the communal kitchen. Also my son has a microwave and refrigerator in his room. I hope she has a great Freshman experience! How far away from home? Is it feasible to do some planning and recon on the local grocery store options? 4. Figure out what you can SHIP TO HER via Amazon or yourself-- or, if you're close enough, what you can bring her in terms of dry goods that you can find and she can't (or which are too heavy to realistically tote back from the store routinely). 5. Work on her cooking skills with respect to this plan this summer-- have her practice-practice-practice, so that she knows how long it takes her in the morning to make a cup of tea and a serving of oatmeal with raisins. There are a LOT of cookbooks if she needs help figuring things out, or doesn't want to halve (or quarter) recipes. College student or Bento cookbooks are your friend. Oh, and the other thing-- have her figure out a system for PACKING food. Food that doesn't make other people go "Uh-- is that what you're eating? Duuuuuuuude..."
Think cute. Bento might be appealing-- that's DD's strategy on campus-- she takes lunch that inspires ENVY, not just "attention." Lemons, lemonade, YK? Pteradactyl chopsticks and FUNKY napkins-- that's all I'm sayin' here. She's not "allergy girl" she's the cool kid. Nobody is thinking allergies when they see what she's eating-- a fruit salad that looks like tiny flowers-- they're wishing that THEY were eating that well. I just finished my first year with peanut and milk allergy. I would be happy to talk with you, but I am leaving for Europe tomorrow morning. You are welcome to pm me and I can give you my mom`s email address. She left this board and won`t post, but she would be happy to talk to you by email. There was good and bad, but mostly good. We did have lots of problems initially and I had to file with DOJ, but most of it worked itself out. Most of what people posted on this thread about 504s is not relevant to college. The standard is not FAPE as it is for K - 12. I had a 504 for K - 12, but it was totally useless for college. I did make it through the year reaction free as far as school meals, did not miss out socially, have a ton of friends, and got involved in lots of activities. My friends were very considerate, but the university repeatedly let me know that they found it inconvenient to accomodate me. The organizations I joined had no problem accomodating me at all. The problem was with the school. (UCLA) They seemed to think that because it is so hard to be accepted there, that they could refuse accomodations. PM me with an email address and my mom can fill you in. Glad that you had a good first year, Beach Girl! I'm guessing that 504 compliance and willingness is going to vary a LOT by institution. What we found (so far) is that having a college-ready, carefully groomed 12th grade 504 plan and accommodations from a testing agency seemed to make everything run VERY smoothly. Sky's has been remarkably easy to deal with-- and I've heard that from other parents whose kids have a variety of disability-related needs that have had to go through the DSO/DSS. Housing/dining is often the weakest link there, so extra time is often needed in order to iron things out. We definitely have seen signs that there would have been some kinks if DD were trying to live on campus. It has been a while since I have posted. This topic is so timely, as last weekend my daughter and I attended the Meet Michigan campus tour (my daughter hopes to attend University of Michigan in the Fall of 2015, she is starting her senior year of High School this Fall). 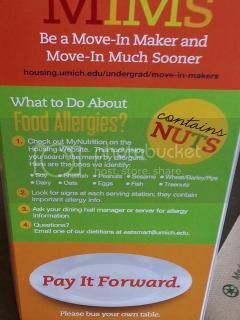 All I can say is that the University blew our socks off in their can do ability to meet the challenges of food allergies! Below is a picture of the signage at each of the tables in the dining hall we ate at (all the procedures and precautions are in effect at all of the dining halls on campus). We knew beforehand of U of M’s ability to meet the challenges – but to see it in action was a sight to behold. We met with the dining hall manager before lunch, and he walked us through their procedures and how they prevent cross contamination; beef and chicken are grilled and baked separately from fish, the dessert kitchen is separate from the meal kitchen and the dessert serving station is far away also. The food allergic student can download an app on their smart phone and place their meal order from it and it will be prepared for them with all safety procedures taken. The dining hall manger told us that “food allergic students should just be worried about their studies when they eat in the dining halls, not their safety.” We enjoyed veggie pasta w/a grilled chicken breast. I had coffee and my daughter had juice. I felt like we died and went to heaven…now begins the early application process --- send good wishes our way. paparenttoo: Thank you for posting and sharing this!! Best wishes to your daughter (and you)! Just wanted to see that bold & quoted: from a staff member who truly GETS IT! !